A Place in the Country is W. G. Sebald's meditation on the six artists and writers who shaped his creative mind and the last of this great writer's major works to be translated into English. This beautiful hardcover edition, with a full-cloth case, includes more than 40 pieces of art and 6 full-color gatefolds, all originally selected and laid out by W. G. Sebald. This extraordinary collection of interlinked essays about place, memory, and creativity captures the inner worlds of five authors and one painter. In his masterly and mysterious style part critical essay, part memoir Sebald weaves their lives and art with his own migrations and rise in the literary world. Here are people gifted with talent and courage yet in some cases cursed by fragile and unstable natures, working in countries inhospitable or even hostile to them. Jean-Jacques Rousseau is conjured on the verge of physical and mental exhaustion, hiding from his detractors on the island of St. Pierre, where two centuries later Sebald took rooms adjacent to his. Eighteenth-century author Johann Peter Hebel is remembered for his exquisite and delicate nature writing, expressing the eternal balance of both the outside world and human emotions. Writer Gottfried Keller, best known for his 1850 novel Green Henry, is praised for his prescient insights into a Germany where the gap between self-interest and the common good was growing ever wider. Sebald compassionately re-creates the ordeals of Eduard Morike, the nineteenth-century German poet beset by mood swings, depression, and fainting spells in an increasingly shallow society, and Robert Walser, the institutionalized author whose nearly indecipherable scrawls seemed an attempt to duck down below the level of language and obliterate himself (and whose physical appearance and year of death mirrored those of Sebald's grandfather). Finally, Sebald spies a cognizance of death's inevitability in painter Jan Peter Tripp's lovingly exact reproductions of life. 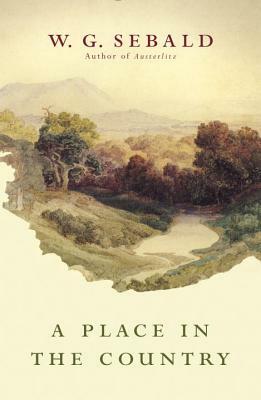 Featuring the same kinds of suggestive and unexplained illustrations that appear in his masterworks Austerlitz and The Rings of Saturn, and translated by Sebald's colleague Jo Catling, A Place in the Country is Sebald's unforgettable self-portrait as seen through the experiences of others, a glimpse of his own ghosts alongside those of the men who influenced him. It is an essential addition to his stunning body of work. W. G. Sebald was born in Wertach im Allgau, Germany, in 1944. He studied German language and literature in Freiburg, Switzerland, and Manchester. He taught at the University of East Anglia in Norwich, England, for thirty years, becoming professor of European literature in 1987, and from 1989 to 1994 was the first director of the British Centre for Literary Translation. His books The Rings of Saturn, The Emigrants, Vertigo, and Austerlitz have won a number of international awards, including the National Book Critics Circle Award, the Los Angeles Times Book Award, the Berlin Literature Prize, and the LiteraTour Nord Prize. He died in December 2001. Translator Jo Catling joined the University of East Anglia as Lecturer in German Literature and Language in 1993, teaching German and European literature alongside W. G. Sebald. She has published widely on both Sebald and Rainer Maria Rilke."